In mid- to late-August the forage here is pretty-much finished, with the exception of himalayan balsam in some of the damper areas and along streams. 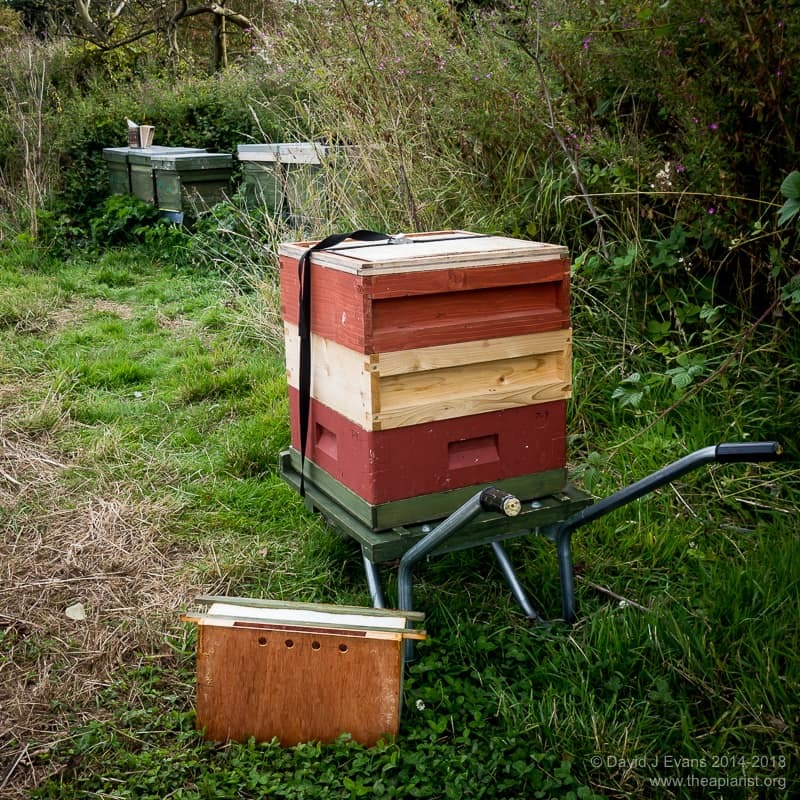 In my main out-apiary stores are running really low in the hives now that the honey supers have been removed. During a recent check by the regional bee inspector (clean bill of health, other than a little chalkbrood) most colonies appeared to have undergone a natural break in brood rearing, with little or no capped brood but clear signs that the queen was laying again. This is a good opportunity to start Apiguard treatment and winter feeding. I use Apiguard for autumn Varroa treatment, either the individual trays which are convenient and easy to handle, or the stuff bought in bulk and spread on bits of card. 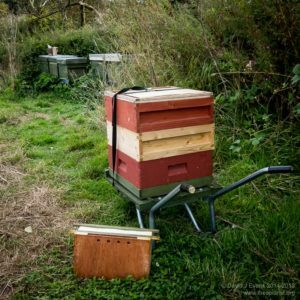 The 3kg tubs contain sufficient to treat 30 colonies – more than I have, but it has a reasonable shelf-life – and is much more economical. Through my association co-operative purchasing scheme an annual treatment with Apiguard trays costs £3.70/colony, whereas it’s only £2.50/colony a year for the stuff bought in tubs … a big enough saving to justify juggling with the messy spatula and scoop while ladling it out onto the cards. The almost total absence of sealed brood in most of my colonies at the moment means that any mites present are likely to be phoretic, so they should be more susceptible to these thymol-based treatments. Apiguard treatment requires two successive two-week treatments and needs temperatures of over 15oC to work properly. Therefore, treat as early as possible … not only does this ensure the temperature will be higher but it also leaves more of the autumn for raising brood to overwinter. Many queens stop laying when the Apiguard is added, so the earlier it is finished the greater the chance that it will still be warm enough to rear those all-important ‘winter bees’ that will get the colony through to the following spring. There are lots of wasps about at the moment so the entrances on my colonies are restricted to 1-2 cm wide … the kewl floors I use provide better protection against wasps, but a simple strip of 9 mm softwood gives even less area for the guards to defend (as an aside, I predicted those DPM ‘skirts’ would still be present at the end of the season back in April). 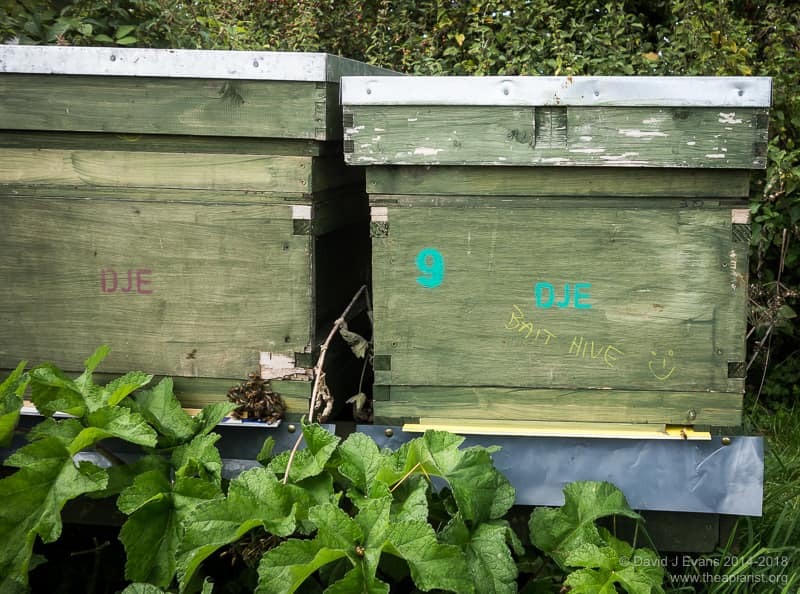 Bees sometimes ‘beard’ outside the entrance of hives with Apiguard on in hot weather – the thymol vapour can get a bit overpowering and can be smelt downwind of the apiary. Being a bank holiday weekend the weather here isn’t warm enough to cause this bearding … the bees in the hive on the left are simply queueing to get in. Since I combine Apiguard treatment with the start of autumn feeding I’ll show how Perspex insulated crownboards can be used for both together in a second post in a few days. 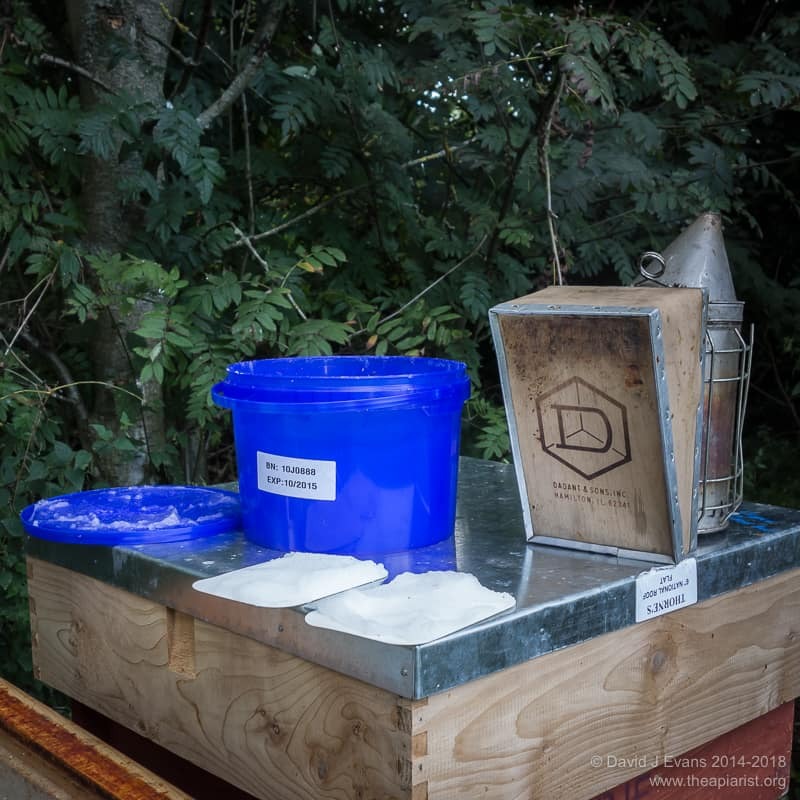 This entry was posted in Beekeeping, Varroa, Varroa control and tagged Apiguard, honey, Varroa, wasps on August 25, 2014 by David.